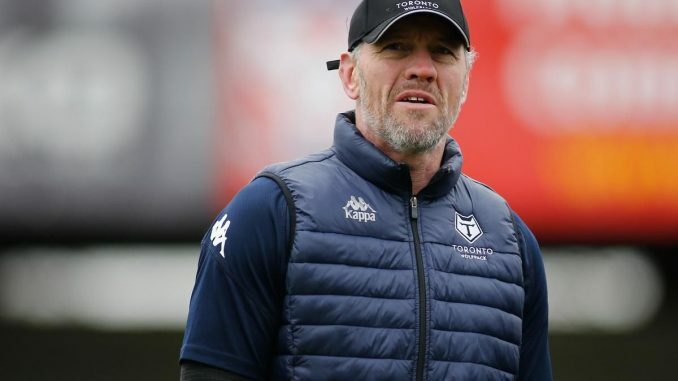 The Toronto Wolfpack made Brian McDermott’s debut as coach a winning one Sunday in an 14-0 victory over York City Knights in Betfred Championship rugby league play. But newly promoted York made it a tough afternoon for the transatlantic Wolfpack, with some stiff defence until the visitors added 10 late points. The Knights gave the star-studded Toronto team all it could handle as it kicked off its third season. McDermott liked his team’s work ethic and defence. “We can build upon that, for sure,” he added. Gary Wheeler scored the Wolfpack’s first try midway through the first half. York held firm until the 69th minute when fellow winger Matty Russell capped off a sweeping Toronto attack in the corner. Russell almost had another try in the 74th minute when he touched the ball down, surrounded by defenders, as Toronto finishing strongly. But his foot was ruled in touch.